Buying a home is an exciting time in our lives. The shiny new appliances, the perfectly painted walls, and the freshly finished floors all put stars in our eyes. But if we don’t have proper inspections completed before we buy our “dream home,” it can quickly turn into a nightmare. This is especially true when buying a stucco home. It’s important to have a stucco specialist or water intrusion specialist inspect before you buy. What Causes Stucco to Become Damaged? Nearly all stucco damage that we hear about comes from water becoming trapped beneath the stucco. But how can you recognize that there is a problem if it is lurking beneath the surface? There are some clear signs to look for if you are considering buying a stucco home or if you already own one. What are the Signs to Be Aware Of? “Stucco Tears”: This term refers to discoloration near window and door frames, which is a sign of missing flashing to carry rainwater away from the home. Cracks and Crumbling: Cracks larger than ⅛” are a sign that water is trapped beneath the stucco surface. Green and Black Discoloration: These two colors typically signify algae, mold, or mildew issues. All of these lead directly back to water. Can’t I Just Fix the Problem Once I Buy the Home? You could. But you won’t want to. If water has invaded a home’s stucco exterior, it is already wreaking destruction on the home’s foundation. The remediation can cost tens of thousands or even hundreds of thousands of dollars in damages. Is Buying a Stucco Home Worth the Cost? The answer to this question depends on how the stucco was originally installed and whether or not it has been properly maintained. During the housing boom, contractors were throwing up houses very quickly and often skipping important steps in the stucco installation process. 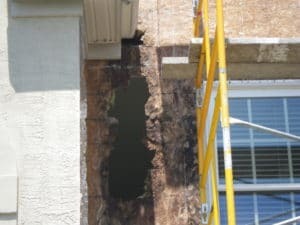 With these poor construction problems not becoming obvious for 15-20 years, homeowners had no idea the issues they would be faced with when first buying a stucco home. At Ai Restoration, we want to help you inspect your stucco home or the stucco home you are considering purchasing. The sooner any problem is identified and remediated, the less damage it can cause. Let us help bring you peace of mind with your stucco questions.